The Number 1 Question Is How Much Does it Cost? We are extremely competitive in our pricing, we don't do outsourcing or contracts. We earn your business one month at a time. Cost depends on the size and scope of the project. NO Contracts Required, NO Gimmicks! What are the most important factors of a website? Visually appealing. Website visitors need to stay and navigate your site. Easy navigation. Your website visitors must be able to find what they’re looking for. Must be easy to find in a website search. Why choose eNet Web Services? eNet Web Services is a Chester county based compnay. We’re committed to local business growth. We provide a depth of resources that can\t be found with other web services companies. Specifically, we've created business review directories, one national and one regional. These review based directories are powerful tools that help us support our clients and businesses around the country. Local Best List, www.localbestlist.com, our national business review directory and Chester County Direct, our regional business review directory, deliver strong search engine results for our clients and directory members. www.chestercountydiret.com Business profiles on our directories are specifically developed to rank well in search engine results. Directories are great for giving websites authority and ranking with topic specific links. We are the only web and SEO company with business review based directories that specifically support businesses in such a powerful way. SEO stands for Search Engine Optimization. SEO involves making sure that your website is created and written in a way that allows it to be found exactly how you want it to be found, when you search on the internet. Search Engine Optimization consists of many things including backlink building, on-page content optimization, site navigation optimization and much more. How do I know you won’t take my website or hold me hostage? You own your website and you only can give us permission to work on your website. As the owner you can lock us out any time. If you’ve lost control or access to your site, we will help you regain control of it. Are there any monthly fees after you build my website? Possibly, yes. If you join us on a monthly maintenance and SEO development plan. We have tiered plans starting out at $50 per month. And no, you do not have to join us for a monthly maintenance plan. Do I have to sign a maintenance contract? 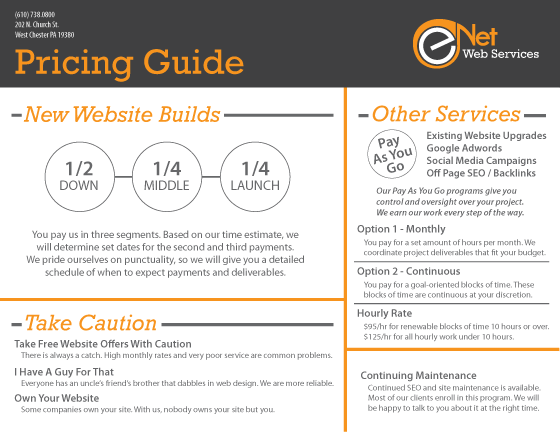 eNet Advertising does not make you sign a monthly maintenance contract. We offer quarterly pay-as-you-go maintenance packages that are very affordable. Is there any fee for inclusion in your directory? Click here to see a brief history of the internet.